As sweet as cinnamon: Fabric, Coffee and Loads Of Fun....Beware Photo Heavy Post! Fabric, Coffee and Loads Of Fun....Beware Photo Heavy Post! 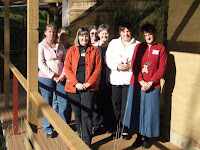 Here is the craft forum ladies posing for a photo....nice and sunny on Mrs Moo's patio. ......Thanks for hosting it for us Mrs Moo. I hope you like the cushion Judy and I made for you so we could all sign it, that way you would not forget us....he he! What a fun day out ... I really love your giftie, so pretty :o). How nice , it really sounds like you all had a great time !